Located near the southern tip of New Zealand's North Island, Wellington is the capital of New Zealand, and the country's second largest urban area. 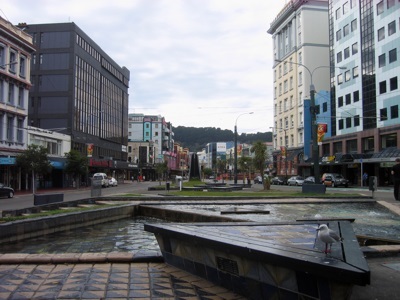 According to the 2006, 179,446 people lived in the city of Wellington. The urban area is of course much larger, and as of 2007, had an estimated population of 431,400. Greater Than a Tourist – Wellington, North Island, New Zealand by Leigh Hogle offers the inside scoop on Wellington. Most travel books tell you how to travel like a tourist. Although there is nothing wrong with that, as part of the Greater Than a Tourist series, this book will give you travel tips from someone who has lived at your next travel destination. The adventure capital of the world, land of black sand beaches, windswept lakes, white snow-capped mountains, forests, misty fjords, tectonic volcanoes and an incredible cultural heritage – New Zealand is currently topping every traveler’s wish list. If this is your first time in this beautiful country, you should plan your trip in detail. If not, you most certainly will miss out on some of the best places to be and things to see. This book will help you to make the most out of your time in New Zealand. You will get to know the most fascinating things to do and see in Oakland, Rotorua, Wellington, Auckland to name a few of the most beautiful locations to be at. Many travellers to New Zealand arrive in Wellington and then head straight down to the South Island to ski and take part in other adventure sports. But, if you're looking for something a bit different from the usual Kiwi travel experience, or if you're looking at supplementing your adrenalin-filled holiday with some downtime in a city, then Wellington is for you. Wellington, New Zealand's capital city is known for its quirky art culture, its boutique shopping, its friendly locals, and its historical heart, and this three day itinerary selects the best of what's on offer. From its natural heritage, to its historical origins, and finally to the modern vibe that keeps the streets hopping, you can experience it all. This guide has been created so that you can get the most out of Wellington with the least amount of stress and fuss. Use the day itineraries to plan what to see and do, and the directions provided to figure out the best way(s) to make your way around the city. What better way to get a real feel for the capital and the country than this museum? Entrance is free or by optional donation. Known for its alternative vibe and colourful atmosphere, this pedestrian-only zone is a must-walk for those who want to get a taste of Wellington sub-cultures, and buy something crazy along the way. Want to see what New Zealand might have looked like 1000 years ago and spot some endangered wildlife? Zealandia will give you the experience to do just that. These sights and many more are included in this itinerary, along with tips on how to get there, what to focus on to get the most out of your experience, and other useful hints. Feel free to contact me via the email address provided under my profile in the itinerary.